Two days of qualification action and three days of dramatic scenes in the main event, the Seamaster 2018 ITTF World Tour Hang Seng Hong Kong Open has provided us with plenty of thought-provoking stories to reflect upon and now the time has come to see which players will enter the history books with four finals taking place on Sunday 27th May. Here’s a look at what’s coming your way on the final day at the Queen Elizabeth Stadium. Play commences at 14.00pm with the first final of the day as two exciting Chinese pairings go head-to-head for the Women’s Doubles trophy. 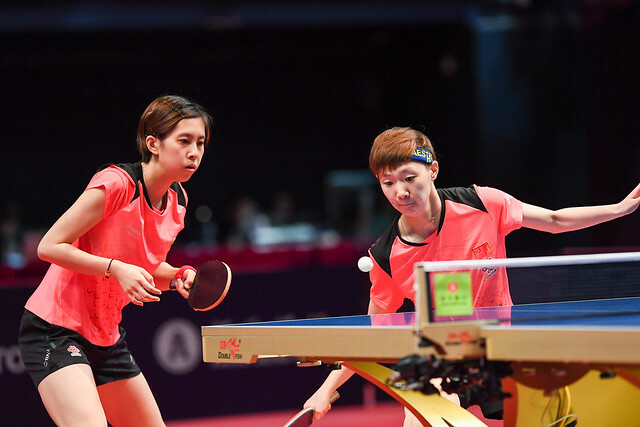 Chen Xingtong and Sun Yingsha are searching for their fourth gold medal as a partnership on the ITTF World Tour and their second of the year while opponents Chen Ke and Wang Manyu look for their second title success as a duo. The two pairings have met in the final twice so far in 2018 with one win apiece, but who will secure the title in Hong Kong? Then comes the Men’s Doubles final which will see Japan’s Masataka Morizono and Yuya Oshima face Hong Kong’s Wong Chun Ting and Ho Kwan Kit in a repeat of the Seamaster 2017 ITTF World Tour Grand Finals Men’s Doubles gold medal contest. Following the medals ceremony comes the first singles duel of the day as Wang Manyu and Chen Xingtong meet in the Women’s Singles final. With three positions separating the two finalists in the seeding list and a superior head-to-head record, Wang Manyu enters the tie with high expectations but the task won’t be easy especially bearing in mind that the full seven games distance was required in her encounter with Chen Xingtong earlier this year in Budapest. Rounding off the proceedings in Hong Kong is the Men’s Singles final and we couldn’t have a more unpredictable match on our hands with two surprise contenders for the title. Both required to compete in the qualification tournament Korea Republic’s Cho Seungmin and Japan’s Kazuhiro Yoshimura have endured a long but rewarding campaign: achieving back-to-back victories over opposition from Korea Republic, the omens are looking healthy for Kazuhiro Yoshimura. Cho Seungmin has already eliminated one Yoshimura so far, beating Maharu in the last eight – can he now add the younger Yoshimura brother’s name to the list of victories? Don’t miss a moment of the concluding day in Hong Kong, watch the action unfold live with itTV.